In 2017/2018, there were 46,025 full-time academic teaching staff in Canadian public universities, a slight increase over 2016/2017 (+0.8%). Underlying this increase was a change in the composition of these staff, influenced by a combination of aging of the professoriate, increased seniority and the growing presence of women. The change in the number of teaching staff was unevenly distributed across appointment categories. From 2016/2017 to 2017/2018, the number of full professors increased by 1.4%, while the next level of tenured staff, associate professors, decreased by 0.9%. The numbers of entry level or assistant professor (+1.7%) and rank below assistant professor (+5.5%) both increased. The university teaching workforce has aged and an increasing proportion of full-time academic staff now occupy the upper ranks. This may be due to a number of factors such as the movement of the baby boom generation through the workforce, as well as the end of mandatory retirement across Canada. In 2017/2018, full and associate professors each accounted for more than one-third of the full-time academic teaching staff in universities; assistant professors for almost one-fifth, and rank below assistant for 8%. 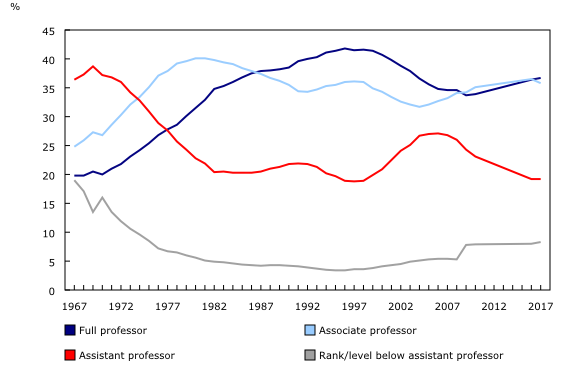 In contrast, in 1970/1971, full professors accounted for one-fifth (20%) of the academic teaching staff; associate professors, for just over one-quarter (27%); assistant professors, for over one-third (37%); and rank below assistant, for 16%. Wages and salaries of academic staff in 2016/2017 (the latest year available) accounted for 34% of the total operating expenditures of Canadian universities, a proportion that has changed little from year to year since 2000/2001. Women comprise an increasing proportion of full-time university teaching staff for all ranks. With the exception of full professors, where women accounted for just over one-quarter (28%) of full-time teaching staff in 2017/2018, women are approaching or have exceeded parity in numbers with their male counterparts. In 2017/2018, 43% of associate professors, 49% of assistant professors and 55% of the rank/level below assistant professor were women. This is in contrast with 1970/1971, when men vastly outnumbered women. In that year, women comprised 3% of full professors, 8% of associate professors, 14% of assistant professors, and 30% of the rank/level below assistant professor. Assuming that the rates of hiring and attrition among full-time professors do not change, it is estimated that the total number of men and women across all full-time university teaching staff will be close to parity in roughly 35 years. However, these estimates could vary based on a number of factors, including the subject domain taught. For example, for some subject taught fields—such as education; health, parks, recreation and fitness; and visual and performing arts—the number of women is now almost equal to, or already greater than, the number of men. In 2017/2018, the median salary of full-time university teaching staff was $131,780, up 2.2% from $128,950 in 2016/2017. This gain partially reflected negotiated salary increases. Salaries, however, differed by rank. The median salary was $160,650 for full professors; $127,840 for associate professors; $101,600 for assistant professors; and $96,960 for the rank/level below assistant professor. Differences in the median salary between men and women academic staff were relatively narrow within academic ranks, with women earning slightly less than men overall. The salary gap was wider among full professors where women still represented a smaller proportion and have, overall, been at that rank for a shorter period of time than their male counterparts. Female full professors ($155,520) earned 95.5% of the salary of their male counterparts ($162,880). However, in 2017/2018, women were at the full professor rank for 8 years on average, compared with 11 years for men. In the other ranks, where women occupy a larger proportion of professor positions and have been at rank for a similar time as their male counterparts, the salary gap is smaller. Female associate staff ($126,620) earned 98.2% of male salaries ($128,930), and female assistant academic teaching staff ($100,130) earned 97.2% of the salary of their male counterparts ($102,980). In these ranks, the average time at rank was: eight years for male associate professors, while for women it was seven years; for assistant professors, it was three years for both. In the rank below assistant professor category, the median female salary ($95,000) was 95.4% that of males ($99,620), the difference being on par with the one for full professors. At this rank, men and women academic staff were at their rank for an average of five years. There are many factors that can explain these gaps beyond the time spent at rank, such as academic, research and labour market experience. Gender differences in median salary also vary among subject taught fields. For example, in business, management and public administration, women earned about 90% of the salary of men. At the other end of the salary spectrum, in agriculture, natural resources and conservation, male and female full and associate professors earned about the same median salary, while at the assistant professor level, women earned slightly less (97%) than men. In the humanities, women earned almost the same as men (98%) at the full and assistant professor levels, and slightly more than men at the associate professor level. 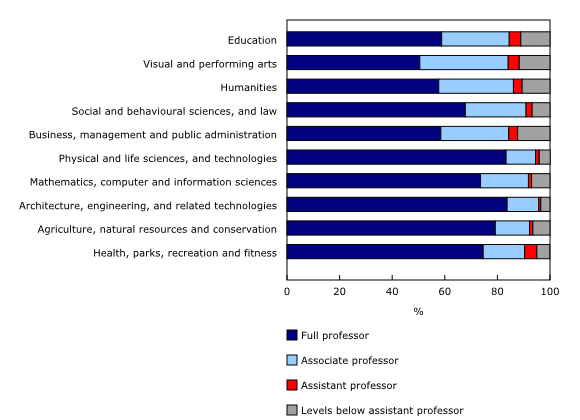 Due to their longer period of education and high level of specialization, university professors enter their occupation at a later age than people in many other professions, and they tend to work to a later age. These characteristics of the university academic workforce have important implications for salary budgets. In 2017/2018, the median age of full-time academic staff was 51 years and this rose by rank: 39 years for assistant professors, 49 years for associate professors and 58 years for full professors. In comparison, the median age of the Canadian full-time working population (aged 15 and older) in 2017/2018 was considerably younger, at 42 years. In 1976, the median age of full-time academic teaching staff was 40 years, compared with 34 years for the Canadian full-time working population in 1976 (the first year for which these data are available). There has been a considerable shift in the distribution of age of full-time academic staff since 1970/1971. From 1970/1971 to 2017/2018, the proportion of staff in the youngest age cohorts (under the age of 40) declined from 59% to 15%. In contrast, the proportion of staff in the oldest age cohorts (60 years and older) increased from 4% in 1970/1971 to 24% in 2017/2018. This reflects the movement of the baby boom generation through the workforce and the aging of the Canadian population. Another important factor in the changing age profile of teaching staff has been the end of provincial mandatory retirement legislation in the mid 2000s. Coincidental with this change, there was a notable increase in the proportion of staff over the age of 65. In 2005/2006, this group accounted for 2% (623 persons) of total staff and in 2017/2018, this grew to 9% (3,980 persons). This trend is consistent with trends in the Canadian population at large, where 6% of Canadians aged 65 and older worked full time, full year in 2015. This was the highest proportion recorded since the 1981 Census. Results from the 2016 Census also showed that highly educated seniors were more likely to work longer than their less educated counterparts (they were twice the proportion of those with a high school diploma or less). The majority of the full-time academic teaching staff who were over the age of 65 were full professors. However, this varied by subject area. 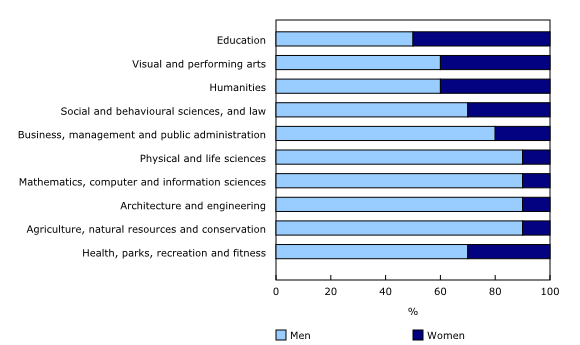 In the physical and life sciences, architecture and engineering and agriculture, natural resources and conservation, full professors who were over the age of 65 comprised around 80% of these staff, while the proportion was lower in the visual and performing arts (50%) and in the humanities (58%). Overall, men accounted for three-quarters of this group. This reflected their being in the system longer, on average for 28 years, while for women it was 24 years. The University and College Academic Staff System provides a detailed portrait of full-time academic staff in public universities in Canada. This includes staff who are full-time and who are tenured, leading to tenure or have contracts of greater than one year. Information on part-time teaching staff is currently not in the scope of the data released today; however, Statistics Canada is currently in the process of expanding the coverage to include information on these staff.